Flash drives are great backup tool used to store and transfer their data. But sometimes unexpected data loss disaster caused by certain reasons can make you lose all your crucial data just in seconds. How to Recover Deleted Files From Flash Drive? It is common wisdom that data loss issue is not avoidable, for various factors can lead to the issue.All these files in flash drive will be lost caused by accidentally deletion or formatting, system failure, device corruption and virus attack. To rescue your files, you 'd better learn how to recover data from Flash Drive,including USB flash drive, MMC, memory card, cf card, etc. If you have deleted files from flash drive by mistake, you'll lose them immediately no matter which way you use to delete them (by pressing "Delete" only or by pressing "Shift" & "Delete" at the same time). That is, all data deleted from the flash drive is permanently deleted. Want to recover permanently deleted files from flash drive? you can get the powerful Bitwar Data Recovery to recover deleted files from flash drive. Bitwar Data Recovery software is designed to easily recover deleted or formatted files from hard drive, SSD, memory card, USB drive, SD card, digital camera, multimedia player and other storage devices effectively, safely and completely. Connect your flash drive to a windows, download and install Bitwar Data Recovery on the computer. If you got a Mac, you can download Bitwar Data Recovery for Mac version and follow the similar steps as below to:How to recovery deleted files on MAC Computer? Tips:DO NOT save any files or softwares to the flash drive where you want to recover files. On the wizard mode of the Bitwar data recovery program, you can see 6 different recovery mode, and each of them focuses on different data loss scenarios. 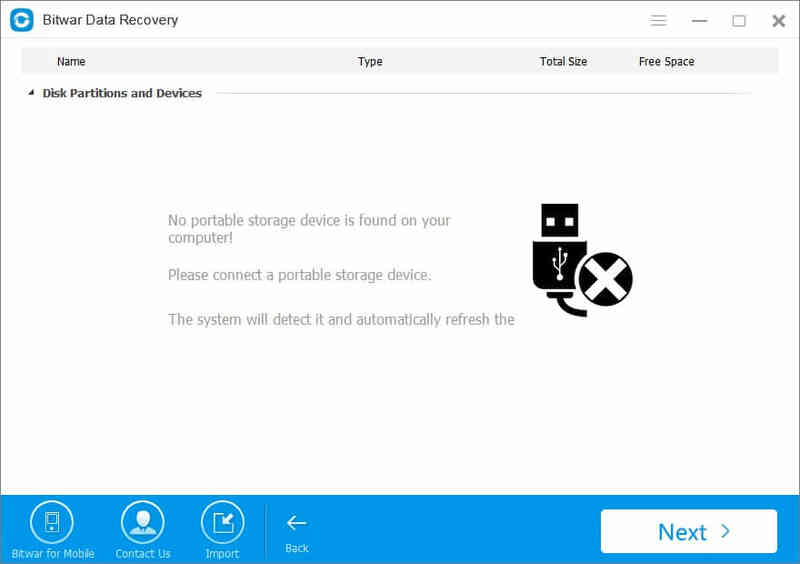 Please select “External Devices Recovery” when you want to recover deleted files from the connected flash drive. Similarly, You can also select “Formatted hard drive recovery” When you want to restore data form formatted flash drive. Please ensure that you flash drive can be well connected with your PC and select it, then click on the butten ”Next”. Select the types of data you want to restore. If the data you want to recover contains more than one type,you can choose multiple or select "Select All Types". then click “Next” to start scanning. After the scan is completed, The found data will be displayed in the middle window area.you can filter through the file name, type, path or time in the tree list on the left. you can preview them one by one. Finally, choose those you want and click "Recover" button to recover them back. NOTE: Please do not save your all recovered files on the flash drive which your loss data before. You should choose a safe storage device in case of data lost again or overwriting. Plus, You can also export all scan results to a specific location after a scan, so that you can load previous results without a rescan when you need it. BUT, please do not export results to the location where data loss appears, because it may overwrite lost data. Note: IF you cannot find your deleted files, you can go to scan again with "Deep Recovery" mode. It can deeply scan and search more files from flash drive. While it will take more time to completed the process of scanning. Successful flash drive recovery is decided on a couple of factors, and you should take precautions when you realize data loss issue occurs. Here are some notes you should keep in mind in order to get successfully data recovery. 1. Stop using the device immediately to prevent further damage to lost data. 2. Do not format or reformat the flash drive, as formatting process does involve writing actions. 3. Do not create new files, move data, copy data or anything else on the flash drive. 4. Close all other programs which might be using the flash drive. 5. Do not try to repair bad sectors for the drive, although it contains bad sectors, for the repairing process destroys data stored on or near bad sectors. 6. If the flash drive is physically damaged, you should contact professional data recovery center which own recovery machines to retrieve data from damaged disks. 7. Carry out flash data recovery as soon as possible. You can use Bitwar Data Recovery to get back delete files.